OK, so Valentine’s Day didn’t seem that great on social this year. In my timelines, I saw everything from margarine to football boots promoted under the guise of being related to the patron saint of love. 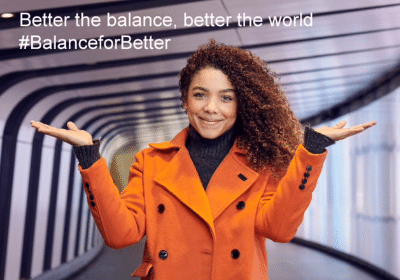 Yes, there’s always lazy, unimaginative campaigns out there on social media, no matter what the occasion, event or holiday. But thankfully there are often those who cut through the noise cleverly linking their objectives to the calendar and remaining to be social. So, in 2017 who went above and beyond the “me too” posts in using Valentine’s Day to really share some love? A celebratory bouquet must go to Historic England for its excellent #EnglandinLove. 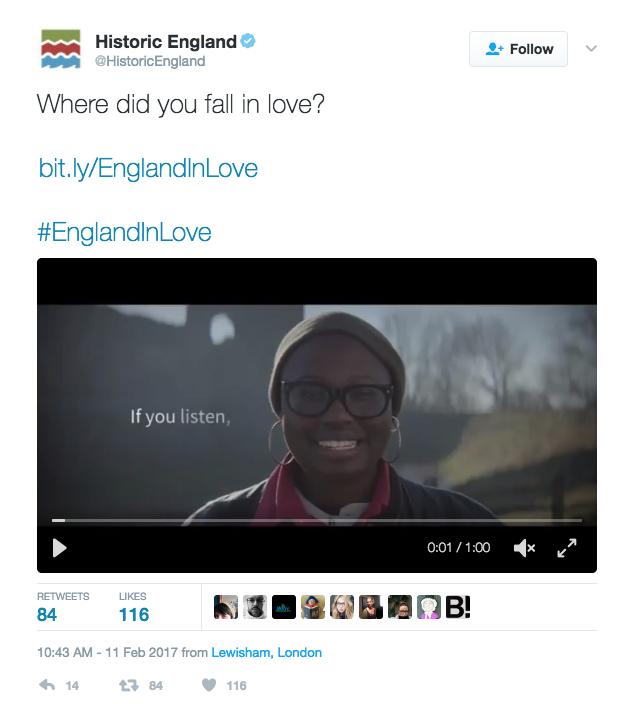 The campaign which is “Celebrating England in Love”, encourages people to tweet details of places they love or where they found romance. 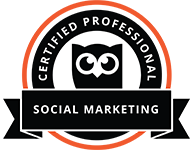 People love sharing on social media, especially if you invite them to do so and make the process simple. Not surprisingly #EnglandinLove trended regularly on Twitter on Feb 14th. Although the campaign was promoted as purely a Twitter event, users tagged their posts with #EnglandinLove on Instagram also. Because place-based photos are incredibly popular on the platform, it will be interesting to see if Historic England look at Instagram to extend campaigns in the future. Baby goods manufacturer Tommee Tippee proved that effective content doesn’t have to be complex, but just well thought out and related to their target audiences. On their UK Facebook page, they simply shared two great visual posts aimed at new mums and dads. In a similar infographic style to their ongoing #ParentOn campaign, Feb 12th saw their post ask “What would you prefer this valentine’s day? 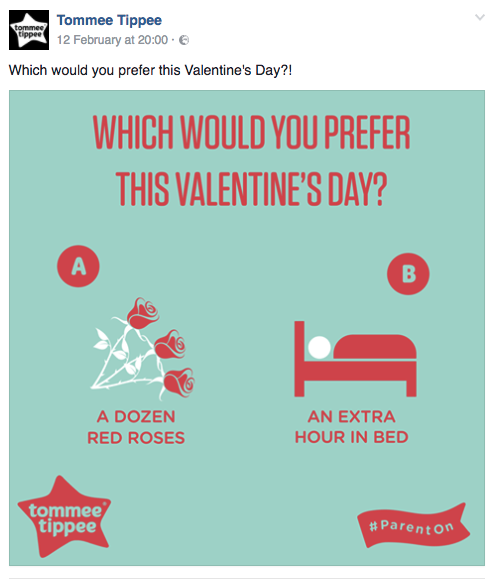 a) A dozen red roses or b) an extra hour in bed”. Not surprisingly for new parents, most comments on the post preferred the extra sleep option. This was then followed up on Feb 14th with a post declaring “Roses are red violets are blue, last year I had one love, but now I have two”, specifically aimed at new mums and dads. 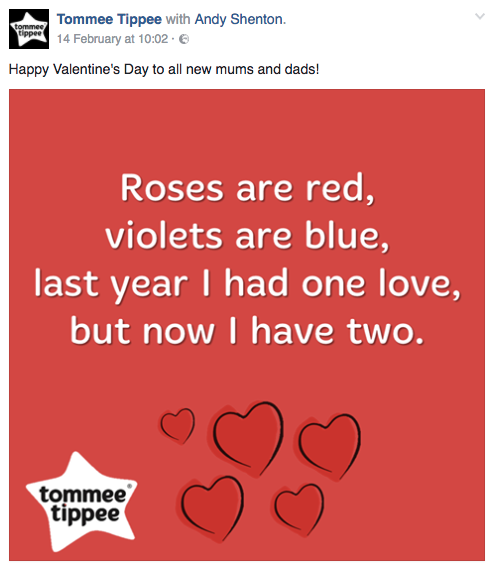 What we really liked was the tone and humour of the posts, which is reflected in Tommee Tippee’s other #ParentOn content. 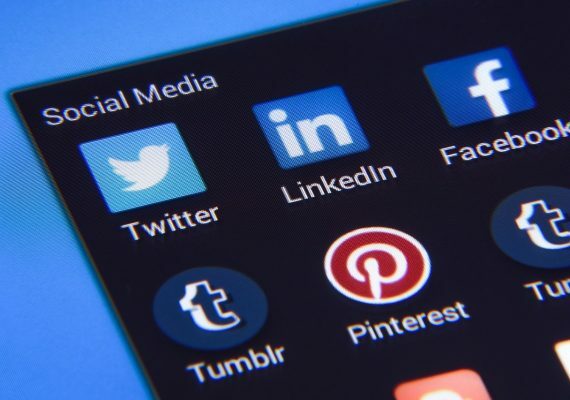 Getting your brand personality right and creating shareable content is a great tactic for increasing your brand awareness on Facebook, as your fans will share content and in doing so increase your reach and visibility. 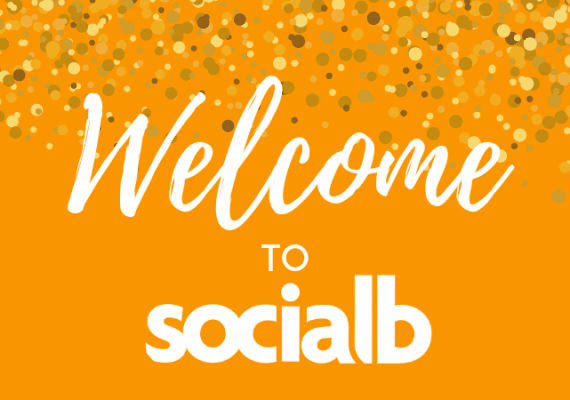 2017 saw brands being able to use new features on social platforms to engage with their audiences. Online retailer ASOS, was one of valentine day’s Instagram Stories pioneers. 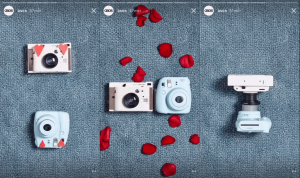 Combining multiple images together, as a stop-start animation, their post told the story of two cameras who see each other, fall in love and kiss. We thought this was great fun and a good example of how to grab attention and effectively use this relatively new Instagram feature. No love for live video? We had hoped that live video on both Facebook and Twitter would play a more prominent role than other forms of content during Valentine’s Day 2017. Having said that the National Gallery featured the Painted Lovers paintings by Veronese in celebration of the day, using Facebook Live to good effect. While over on Twitter it was very quiet on the live/Periscope front with brands and organisations preferring more traditional content forms. We love creativity in social media and it was great to see that some had marked Feb 14th by putting that creativity to good use. We’re also sure that there must be other great Valentine’s Day social campaigns out there, let us know what your favourites were.